Searching for a job where you can grow along with us? Do you envision your future in management consulting, where you could assume responsibility and make a difference? Are you a team player, want to work in surroundings where colleagues try to do their best, support each other, and benefit from each other? Then b.telligent is the right place for you. Here, you can delve into BI, CRM, DWH, and big data – we have the right entry points and development paths to suit any stage of a career. At b.telligent, we start to look for future employees early on, especially at universities. During the year, we attend several job fairs across Germany to talk with young professionals and meet them at our booth. Curious about when we’ll be in your city? Stop by at one of our events to find out more. If you commence your career at b.telligent, you’ll be able to put your knowledge into practice at a client’s premises, while working within a complex IT environment. In addition to your technical skills, we are quite interested in your personality. As a professional, you’ll discover an excellent atmosphere to gain and share knowledge. You’ll have the opportunity to attend conferences, exhibitions, and training sessions (in-house and outside) to keep you at the cutting edge of technology – and you can apply this profitably while working for a client. Top Job Prize in 2017: b.telligent is counted among the 100 best mid-sized employers in Germany. Each year, a specially developed search process is initiated to find the best employers and recognize them with this ‘Top Job’ award. The needs and desires of employees change over the course of a career. Hence, it is crucial to find the right balance between work and your private life. Nowadays, balancing your career with your family is more important than ever before: regardless of whether you need to look after and raise your kids, or care for family members, or possibly just take some time off to pursue hobbies, further education, or travel. With us, you will not have to choose between work and family – because we guide you in coalescing your career with your family life. Our employees prove almost daily how this is possible when working on a project. 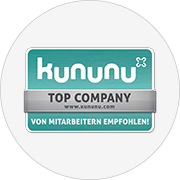 The berufundfamilie certificate, which we received in 2014 as a management consulting firm, is an important recognition of our HR policy that clearly accounts for your family and its life-cycle. The audit for the berufundfamilie certificate is sponsored by all leading professional associations in Germany. It is a strategic management instrument that develops and provides tailored, profitable solutions to better balance your job with your family. At b.telligent, we have a family-oriented HR policy firmly anchored in our corporate values to address any phase of your family life. Are you and your family curious? Don’t hesitate to contact us and convince yourself of the options we offer! We’d be pleased to answer any questions. We could tell you a lot about us, but perhaps it’s best to form your own opinion by visiting Kununu. For job openings, please click here.